In 1907, the Pittsburgh Pirates made their first appearance in the Fulton County area when they played an exhibition game at A., J. & G Park/Parkhurst Field on July 24, 1907. The game was against the A., J. & G’s of the New York State League, and was the result of a long-time friendship between Pittsburgh Pirates owner Barney Dreyfuss and the A., J. & G manager Howard Earl (former Major League Player). The pair set up the game to fill in a travel day (and help defray the teams travel expenses) for the Pirates as they traveled from their July 23 game in Boston against the Boston Doves, and were in route back to Pittsburgh for a series against the Philadelphia Phillies beginning on July 25. The Pirates team was led by future baseball hall of famer Honus Wagner, who at the time was 33 years old and in the prime of his Hall of Fame career (11th season). Also on that team was Albany native Edward Jaykill Phelps. Phelps, a catcher, was born in Albany in 1879 and after playing school ball for Albany High School, began playing professionally at the age of 19 for the Danbury Hatters of the Connecticut State League. After four seasons with various teams in the minor leagues, his contract was purchased by Pittsburgh Pirates owner Barney Dreyfuss from the Rochester Bronchos of the Eastern League in 1902. Phelps was considered a very good catcher who could hit, throw and run the bases with speed. He would help the Pirates win the 1902 and 1903 National League Pennants and played in the 1903 World Series against the Boston Americans and Cy Young. 1903 marked the first modern World Series pitting the top team from the American League going up against the top team from the National League for a best-of-nine games championship series. Boston would win the series 5-3, and Phelps claim to fame would become that he was the first National League catcher in the history of the World Series, as he was behind the plate for the Pirates in all 8 games. Phelps is also known for the “Phelps Decision” that took place in 1906. After the 1904 season, Phelps was traded in February 1905 to the Cincinnati Reds. He would spend the entire 1905 season as the back-up catcher for the Reds, playing in 44 games and batting .231. In mid-May of the 1906 season, Reds owner August “Garry” Herrmann (who was also the chairman of the National Baseball Commission) asked waivers on Phelps. But before the 10-day waiver period had expired, Herrmann sold Phelps to the Boston Pilgrims of the American League. On the 10th day of the waiver period, Phelps signed contract with Barney Dreyfuss to go back to the Pirates. Although the Pirates already had two catchers, Dreyfuss knew Phelps could hit and run well, so tried to being him back to fill the pinch hitter role for his club. However, this caused a debate over who owned the rights to Phelps; Boston or Pittsburgh. With the National Agreement of 1903, which brought peace between the veteran National League and the fledgling American League, a three-person governing body of Major League Baseball was created called the National Commission. The Commission was made up of the American League President (Ban Johnson in 1903), the National League President (Harry Pulliam in 1903) and a Chairperson to make the ultimate decisions on any debates pertaining to the league. Because of his instrumental role in brokering the peace accord between the two leagues in 1903, Reds owner Herrmann was named the chairman. Under the rules of the commission, the chairman (Herrmann) had absolute power in the resolution of contractual claims and disputes. In the Phelps situation, Herrmann ruled in favor of Boston, claiming that Phelps had given him permission to sell his contract to the Boston Pilgrims. Phelps was adamant that he had not given Herrmann permission to sell his contract. Herrmann was also steadfast to his version of the situation and held to his decision that Phelps’ contract would remain with the Boston club. Pirates owner Barney Dreyfuss, who had always been outspoken in his belief that as a team owner, Herrmann should not hold the position of leading the commission and making decisions that could favor his own team. A week later, Dreyfuss brought to light that he had a source who claimed that Herrmann had wagered $6,000 that the Pirates would not win the 1906 National League Pennant. Herrmann did not deny the alleged wager, but claimed that it had been made in jest, after a night of drinking. Caught in a very difficult position, Herrmann reversed his decision and awarded Phelps’ contract to Dreyfuss and he went back to the Pirates. This was the first time that the National Commission had been placed in such an awkward position. It would not be the last and such conflicts of interest of an owner also heading up the governing body of Major League Baseball would taint the sport until the Black Sox scandal of the 1919 World Series eventually brought the commission down. The scandal would lead to the creation of a full-time Commissioner of Baseball position in 1920, when non-baseball figure and Federal Judge Kenesaw Mountain Landis was hired to clean up the game and restore public faith in America’s national pastime. Phelps career as a Major Leaguer would last through 1913 and he would also play for the St. Louis Cardinals and the Brooklyn Dodgers. After 11 seasons in the Major Leagues, he returned home to upstate New York be the player/manager of the Albany Senators in the New York State League in 1914 and 915. In 1931, Phelps, along with fellow area ex-Major Leaguer Matty Fitzgerald, would be back involved in high level baseball as commissioners of the Albany Twilight League that was formed at Bleecker Stadium in Albany. The league, which is still in existence today, featured the best amateur players in upstate New York. Phelps would make his last public baseball appearance at Shuttleworth Park in Amsterdam in 1939. It was for “George Burns Day” at the park that was honoring Gloversville resident and former Major Leaguer George Burns, who had a 15-year career in the Big Leagues with the New York Giants, Cincinnati Reds and Philadelphia Phillies. Phelps, along with 6 other former Major Leaguers from the Capital District were in attendance for the event. Phelps died in East Greenbush in 1942 at the age of 62, and is buried in the Greenbush Reformed Cemetery. While it has been 75 years since his death, the Phelps name was recently heard over the public-address system at Parkhurst Field a few weeks ago during their annual Vintage Baseball Game. The game featured a matchup between the Whately Pioneers of Western Massachusetts and the A., J. & G’s of Fulton County. The game was played by the rules of MLB from 1886 and the players wore throwback uniforms and played utilizing period authentic equipment. The local A., J. & G. team is traditionally made up of former local Little Leaguers from Amsterdam-Johnstown-Gloversville (A., J. & G’s), but this year’s team welcomed a duo from Troy who brought back a nostalgic piece of the parks history 110 years after Ed Phelps and the Pittsburgh Pirates played there in 1907. The duo was Jim Phelps and his son, Cody; the great grandson and great-great grandson of Ed Phelps. Several months prior to the event, the elder Phelps had reached out to a board member of the Parkhurst Field Foundation about his great grandfather’s connection to the park. The two Phelps descendants were then asked to get take part in the game. The youngest Phelps (Cody) took on the role of A., J. & G. bat boy, while the elder Phelps suited up to play. Ironically, Cody’s middle name is “Jaykill,” which was given to him as a tribute to his great-great grandfather who had the same middle name. Jim, presently a Rensselaer County Sheriff, played baseball for Columbia High School growing up and on local travel teams. 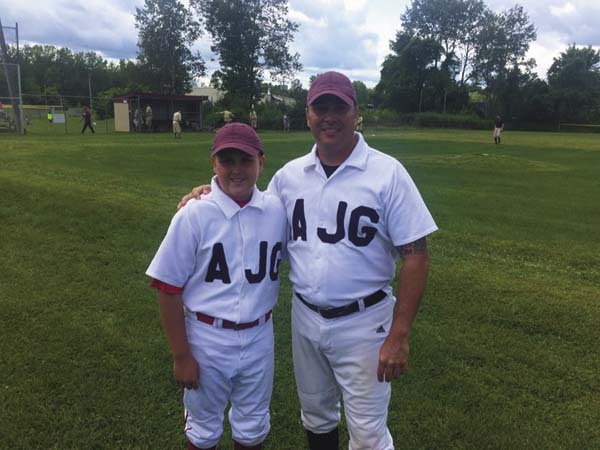 Other than pick-up softball games and throwing batting practice to his son, Cody’s youth travel teams, Jim had not played in an organized baseball game since enlisting in the Air Force more than 25 years ago. Despite the long lay-off from the game, the “Phelps baseball gene” showed up during the game, as Jim went 2-for-4, driving in two runs and scoring one as the A., J. & G’s defeated the Pioneers by a score of 15-8. After the game, the Phelps family reflected on what the day meant to his family. Photos and game used equipment from both this year’s vintage game and the historic visit by Ed Phelps and the Pittsburgh Pirates in 1907 are on display at the Parkhurst Field Museum located on premises at Parkhurst Field (50 Harrison St. in Gloversville). 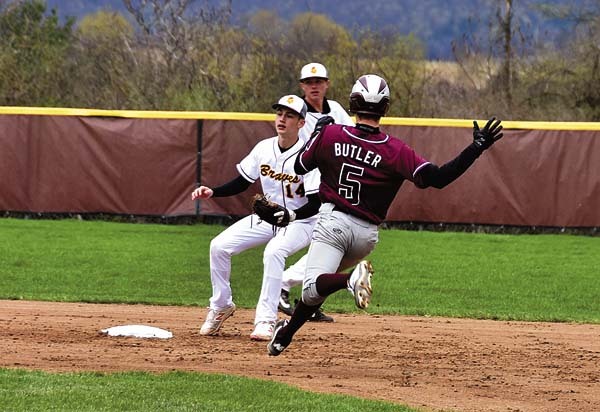 Admission is free and the museum is open whenever a Gloversville Little League game is taking place.